Wellness journeys in Maldives that activate, relax and renew. Join in the occasional yoga class or embark on a multi-day programme of health and wellbeing. With resident fitness gurus and chefs specialised in healthy cuisine on hand, let us guide you on your journey of renewal. Embrace the wisdom of a 5,000-year-old science. Align body, mind and spirit. Heal with nourishing cuisine, gentle exercise, meditation and soothing spa treatments. Enjoy solo or multi-day treatments tailored to your doshas. Find deep relaxation, as well as improved health, with an array of Ayurvedic therapies both time-tested and tailored to your needs. Enquire about our targeted treatments for weight loss, joint pain, high blood pressure and migraines. Embrace the early morning sun with sun salutations or Surya Namaskar. Focusing on alignment and breathing, energise your body and mind as you stretch and strengthen all of the major muscle groups. Combat daily stress with Pranayama yoga – the highest form of purification and self-discipline for both body and mind. To control the prana, or life force, is to achieve awareness and a deep sense of relaxation. Follow with meditation for peace and rejuvenation. The classic yoga practice. A gentle flowing session that combines held asanas and breath control. Increase muscle tone, core strength and flexibility. A non-stop sequence of asanas and breathing through each movement. Typically fast paced, vigorous and physically challenging, Ashtanga is suitable for those wishing to take their practice to the next level. 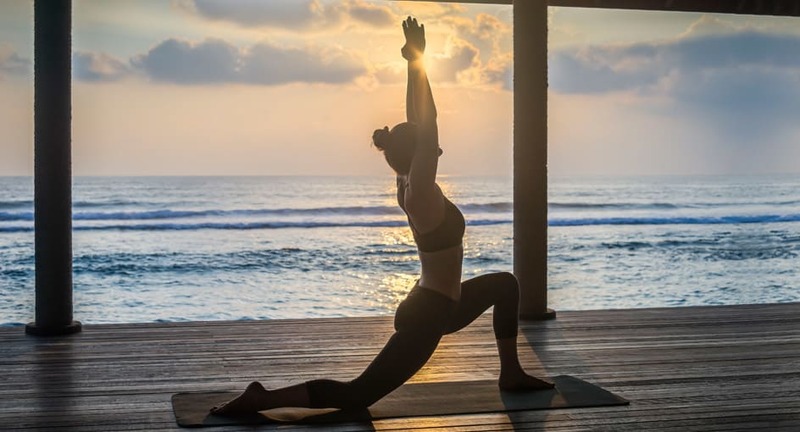 For millennia, yoga has been used as a way to gain and maintain a healthy body – it influences the metabolism by acting upon several hormonal secretions. Target unwanted fat pockets in the body. Achieve better muscle tone and vitality. Detox Yoga Flow sessions are designed to release muscular tensions and sculpt you back into shape. Release body tensions and detoxify. Master the inversion. Particularly effective for the waist and legs. Gym meets pool with exercises that are easy on the joints while providing all the benefits of a cardio class. The underwater release of gravity leads to the body’s ability to find optimum stretch. Body sculpting is a non-aerobic, muscle-toning class that focuses on building core strength. Classes use various equipment to help intensify your workout. With short but intense cardio intervals, full-body strength moves, and an extra dose of ab work, slim down your entire body and tighten your tummy. This strength and conditioning workout increases your metabolism so you'll continue to burn calories hours after your session. Get fit and toned with a gentle workout that focuses on core strengthening and breath control. Target each muscle group with floor exercises using an array of apparatus. Revitalise your body with our latest wellness therapy that delivers vitamins, minerals, amino acids and other vital nutrients into the bloodstream quickly via intravenous drip. Choose from a variety of sessions to cure jetlag and hangover, boost your immune system, rehydrate, detoxify, promote weight loss and improve overall wellbeing. Gopal Govindasamy is a Naturopathic Doctor and yoga expert from India, specialized in Ayurveda, wellness, nutrition and lifestyle. He has been a leading wellness expert for over 16 years, with yoga training from the world famous Sivananda Yoga Institute. His record for relieving and correcting persistent physical problems has resulted in an international reputation as "Dr. Magic Hands”. Rui Pedro Loureiro is a Traditional Chinese Medicine Doctor and licensed acupuncturist. With over 17 years of research and practice in his field, he invites you to harness the power of acupuncture to treat a host of ailments, from joint pain, backache and arthritis to chronic headaches and migraines. A holistic healer for over ten years, John Sanchez practises Traditional Chinese Medicine, acupuncture and Na massage therapy. He is also a Chinese herbalist, nutritional therapist, and master of yoga, Tai Chi and Qi Gong. Toby is a holistic health and wellness specialist who has practised Eastern healing arts for nearly 20 years. Whether your goal is to create a healthier lifestyle and more positive way of thinking, to revitalise your energy levels or let go of stress, Toby’s broad expertise offers highly effective pathways towards clarity, health and holistic wellbeing. Get your daily dose of yoga in a tropical paradise with Dr. Raj, our resident yogi. Energise with power yoga, or try our signature yoga course for better sleep and concentration, stress relief and anti-ageing benefits.